It is important for parents to review their contact information by this date to make sure that the printed directory is as current as possible. You must be logged into the PTA website to view the directory. 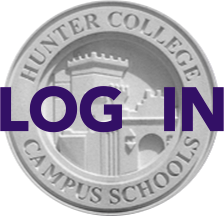 (If you are having trouble logging in, please follow the instructions at hunterschools.org/howtologin). Click on #3 “Edit Directory Listing." Make any required changes and remember to press the "Click Once to Update" button at the bottom of the screen. The Online Parent Directory is a great source of contact information and search tool for parents to use throughout the year. By editing your directory listing, you have full control over what information other parents see regarding your family. PTA Dues for the 2018-2019 year are now being accepted online at hunterpta.org/dues. Simply use your credit card to make your payment. Dues are $75 per student. You may send a check instead, payable to Hunter College High School PTA, to the address listed online. Each family that pays dues ($75 per student) will have the option of receiving a copy of our printed Family Directory in October (you can choose to opt out when you pay your dues). The Directory lists contact information for students, parents, faculty and staff. The same information is available in the Online Directory. Your dues also pay for the Hunter Calendar, enable us to provide all the useful information found on the PTA website, and fund events, workshops, and PTA meetings that bring our parent community together. If your child was not able to hand in a form at orientation, you may go to the MyLifeTouch website and use the school Picture Day ID code: OV148116Q0. Wednesday, September 26 at 7:00 pm - First PTA Meeting in the school auditorium. Pre-meetings will begin at 6:00 pm (details in an upcoming email). Friday, October 5 - Open School Day for Parents. The full 2018-19 Calendar is now available on the PTA website. Updates are made to the online version of the calendar throughout the school year. We look forward to seeing you at school!